My Double Four Patch quilt came back from my friend Eleni. 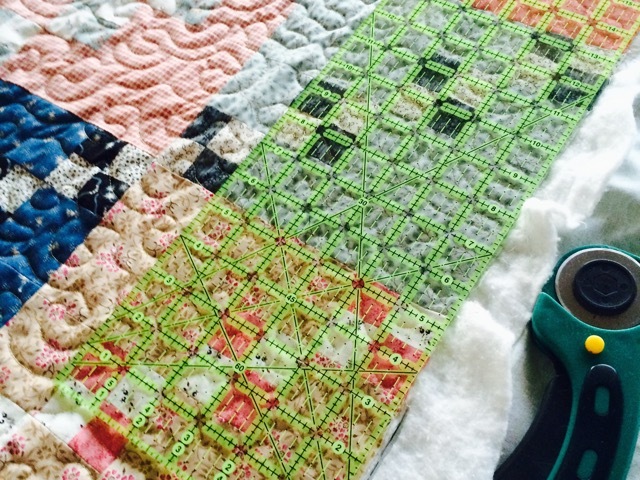 So grateful to her for her quick and wonderful long-arm quilting! 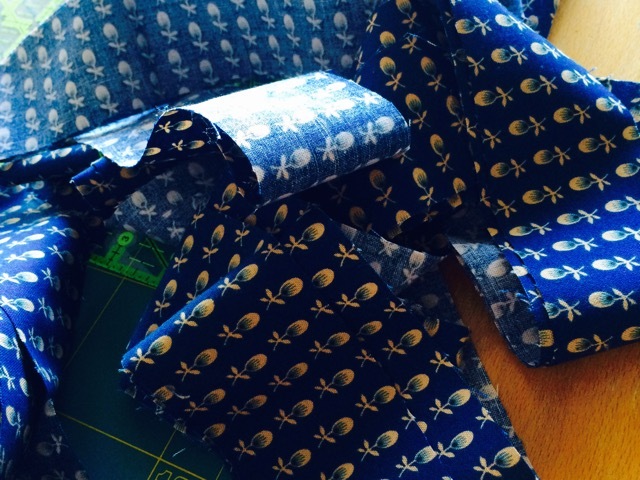 I chose a dark blue fabric for the binding. I have been sewing the strip on the wrong side and then turning it on the right side, sewing very carefully on it. The end result is quite satisfying from my point of view. C'est toujours génial d'avoir une amie avec une Long-Arm !! Hi ! Hi ! Et je fais comme toi pour le binding, à la machine cela permet de consolider le travail. Ton quilt va être très beau ....j'attends de le voir dans son intégralité. Bonne journée chère Christine et à bientôt ! Congratulations on your BEAUTIFUL finish! I also like machine-sewn binding. It is quicker and more durable. Your sister can wash the quilt without worry. Lovely! What a lucky sister you have!! Oh my goodness I was just talking about this type of sewing of the binding last night. I have a double quilt that I just finished putting the binding on and now have to hand sew it. Not looking forward to it. I want it done! Do you have any tips on how to machine sew it on both sides? Thank you for your comment Vickie, but I have no other tip than the one written in the post. I too tried this way of sewing binding and it did save a lot of time! You have a lovely quilt there - lucky sister. 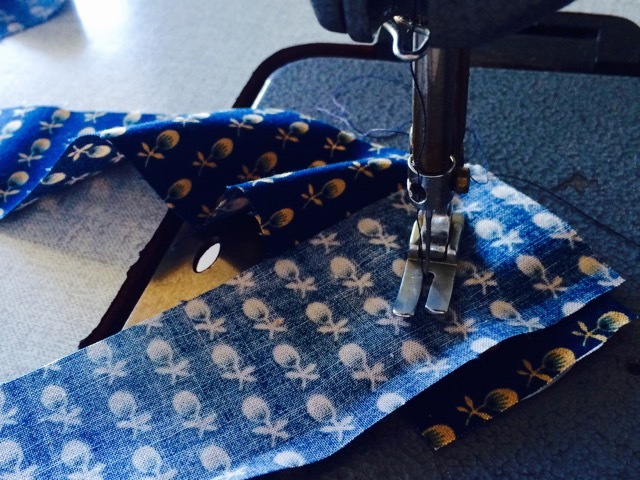 I just did that today - machine sewed a binding strip down instead of hand sewing it. I didn't even think to sew it to the other side. 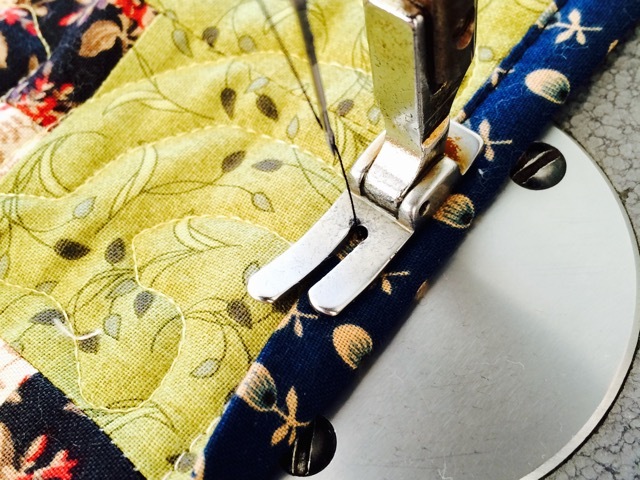 Great idea - that way you can see exactly whether you are sewing the binding down properly! I enjoy had stitching my bindings but when I'm in a hurry this is my method as well. 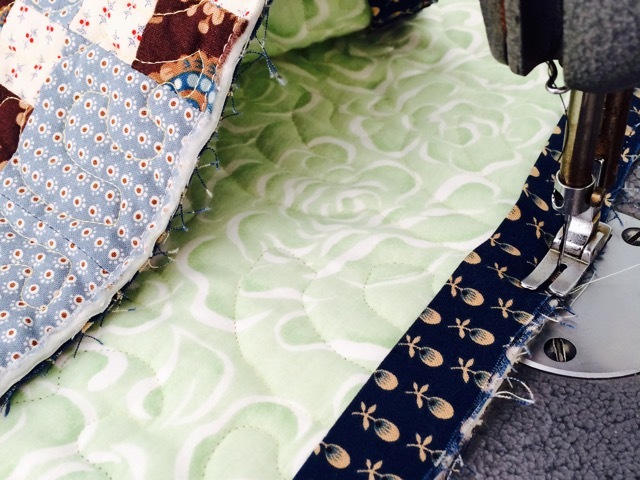 The bits of quilting I see here look lovely. Lucky sister! Le quilting a du le transformer. Bonne idée et je retiens l'idée de commencer par l'envers,ou le côté que je veux moins voir! great double four patch quilt. Your machine binding looks great and will be strong. Oh, I love your fabric choices! That navy/dark blue fabric on the binding is wonderful.